Melmaniel system, Verge Vendor region. On the 8th of January at 9:47 EVE Standard Time, a large capital engagement unfolded in the system as Escalating Entropy [CHAOS] clashed with Snuffed Out [B B C] and Project.Mayhem. [16-13]. The battle was prompted by Snuffed Out forces, who had reinforced a tower belonging to Escalating Entropy in the system. With the tower situated on a valuable moon and coming out of reinforcement mode on the morning of the 8th, both sides prepared for a major confrontation. Snuffed Out and Project.Mayhem formed a joint fleet of Machariel battleships numbering 60 pilots, with eight Revelation dreadnoughts to be used for the tower’s destruction. The force made its way to the system, setting up on the tower as it exited its invulnerability period, ready to destroy the structure. 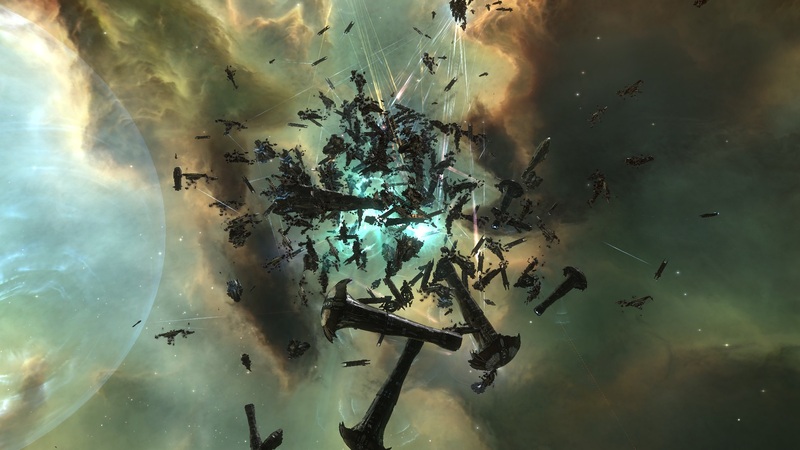 Escalating Entropy formed a 100 pilot fleet to defend the tower. Originally the alliance wanted to form a Rattlesnake battleship fleet, but scouts quickly informed its fleet commanders that Snuffed Out staging system had an unusual number of pilots, with Project.Mayhem pilots seen traveling towards it. To add to that, The Initiative. [INIT. ], who has often worked with Snuffed Out in the past, had a large spike in the number of pilots in its staging system as well. Sensing a trap, the alliance opted instead to form an Archon carrier fleet with force auxiliary support and a wing of dreadnoughts. Shadow Cartel [SHDWC], long time ally of the alliance, was also informed of the situation. As the Machariel fleet set up on the tower, a cynosural beacon suddenly lit up next to it, ushering in the Escalating Entropy force. Into the system jumped the entire Archon fleet with its force auxiliaries and five Revelation dreadnoughts, specifically fitted to soak a huge amount of damage, the rest of the dreadnought wing kept in reserve. Snuffed Out/Project.Mayhem reacted immediately, revealing its own capital fleet. The two alliances had gathered a 100 pilot capital force of their own, including carrier and dreadnought wings. This brought the total number of pilots in their fleet to 160. 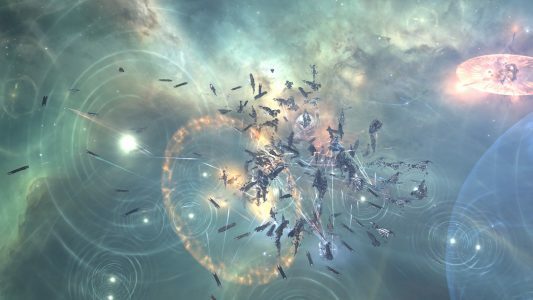 The capitals materialized on grid, dreadnoughts entering siege mode and firing on their Escalating Entropy counterparts. Within seconds the grid descended into chaos. The battle was fought at close, point blank range. Escalating Entropy immediately brought its dreadnought reserve into the field. The two capital fleets squared off, dreadnoughts exchanging blows. Meanwhile, carriers unleashed squadrons of fighters, the Escalating Entropy fleet targeting enemy dreadnoughts, while the Snuffed Out/Project.Mayhem carriers mostly deployed space superiority fighters, meant to remove the enemy fighter contingent from the field, paving the way for later reinforcements. Dreadnoughts slugged it out, the Machariel fleet mostly forgotten, relegated to the role of tackle, adding its comparatively meager firepower to the mix. Capital after capital succumbed to the immense firepower present on the battlefield, dreadnoughts exploding with every barrage in blinding flashes. 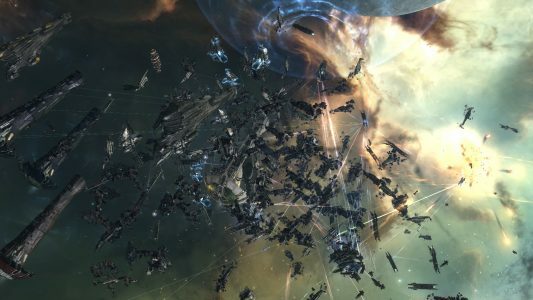 Back and forth the two sides traded behemoths, Escalating Entropy managing to edge over its assailants, often managing to bring down 2-3 dreadnoughts for each of its own. This was due in part to its massive force of fighters, which traveled across the battlefield like a deadly swarm, descending upon primaries like locusts and devouring them whole. However, the attackers’ space superiority fighters were wreaking havoc on the swarm, claiming more squadrons every minute, though Escalating Entropy carriers had more in reserve. As the battle continued to rage, reinforcements arrived for both sides. Shadow Cartel pilots joined the Escalating Entropy fleet, jumping to the still blazing cynosural beacons more carriers and dreadnoughts. As for Snuffed Out and Project.Mayhem, the Initiative finished its quick form up and burnt in range of the system, bridging into the fight itself. The Initiative initially had a mixed 80 pilot fleet, mostly of Machariels, but also dreadnoughts and force auxiliaries. As the battle progressed this fleet would swell to nearly 170 pilots, as it continued to trickle in ships as the battle wore on. With the Initiative reinforcements coming in, the trade off of ships evened out. Dreadnoughts melted away, each minute seeing several of the capitals destroyed in continued volleys. Fighter squadrons were decimated as well, dozens of the agile ships brought down in relentless exchanges between the behemoths. Quickly, the remaining ships found themselves fighting in an expanding graveyard, as enormous wrecks littered the field. The battle continued without pause, both sides keeping their sights squarely on each others’ dreadnoughts. However, after nearly half an hour of carnage, the number of surviving dreadnoughts had lessened considerably. The center of the battle saw the worst of it, a huge cloud of debris having formed from the remains of all the dreadnoughts slaughtered amidst the fighting. The dreadnoughts still intact were mostly at the edges of the fight, having bumped out in the initial drop, too far to participate in the actual firefight. Having suffered heavy losses, but dished out quite a bit of damage themselves, the Escalating Entropy fleet and its Shadow Cartel allies prepared to extract. With most of their dreadnoughts gone and the enemy seemingly able to constantly reinforce their fleets, the time to withdraw was drawing closer. However, this was not the only contributing factor. Snuffed Out had deployed two super capital squadrons to the system, keeping them tethered on a friendly citadel, waiting to commit them to the battle. The reason behind holding them back was the presence of many space superiority fighters present in the swarm deployed by Escalating Entropy, which would easily annihilate the fighter bomber squadrons of the super carriers, nullifying them completely. Yet, with many of those squadrons destroyed in the fighting, it was only a matter of time before Snuffed Out would bring them in. Thus, preparations were made to withdraw, with force auxiliaries and what few dreadnoughts remained given the order to cycle down their triage and siege modes. While waiting for the last few ships to follow the order, the Escalating Entropy fleet concentrated its remaining firepower on the attacking fleets’ force auxiliaries. Under the pressure of capital energy neutralizers, the force auxiliaries were almost instantly drained. This led to their armor hardeners turning off and their armor repairers not working, as they could not be activated. Seven Apostle force auxiliaries were destroyed, one after the other. With the field sufficiently clear of dreadnoughts and fighters, Snuffed Out felt safe to bring their super capitals in. The two squadrons warped into the center of the fight, quickly deploying fighter bomber squadrons or activating doomsday devices and focusing their devastating power on the Escalating Entropy and Shadow Cartel carriers. The Initiative brought its own super capitals, a similar sized force (two squadrons) which jumped into the system, landing approximately 50 kilometers from the maelstrom. The new arrivals swiftly followed suit, targeting the hostile capitals and unleashing their immense firepower. For Escalating Entropy and Shadow Cartel, this was a sign to leave. Those carriers and force auxiliaries with enough capacitor jumped out of the system to emergency exit cynosural beacons. Those that lacked the needed energy warped off the safe citadels. The attackers made an effort to hold down as many of the ships as possible, and those snared by the Machariel fleets and their heavy interdictor squads were unceremoniously dispatched. Clearing the field from the last stragglers, Snuffed Out, Project.Mayhem and the Initiative looted the field, scavenging anything worthwhile and still intact from the hundred of capital corpses strewn near the tower’s shields. With the field stripped of valuables, the attackers proceeded to destroy the tower, easily bringing it down with the immense firepower still present on the field. With the tower destroyed, Snuffed Out deployed its own, bringing it online and securing the moon for the alliance. With complete victory achieved, the attacking fleets dispersed, safely extracting their super capitals and what remained of their capital fleets. With the behemoths safe and sound, the sub capital fleets withdrew, bringing the bloody fight to a close. Battle report for the Melmaniel system can be found here. All told the battle was fought for 49 minutes, with the system hosting 460 pilots at the height of the engagement. Time Dilation spiked at various points in the fight but either quickly subsided or kept between 80% to 90%. Only once near the end of the battle did it reach 45%. 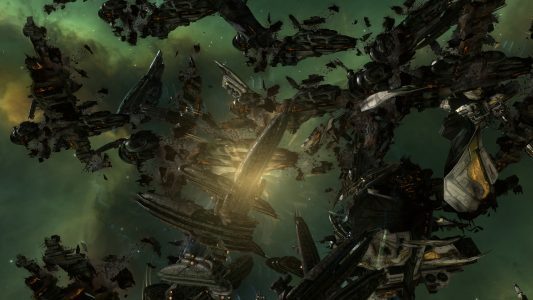 Escalating Entropy and Shadow Cartel lost a combined 96 ships, including 62 dreadnoughts, 18 carriers and 5 force auxiliaries for a total of 252.11 billion ISK damage. Snuffed Out, Project.Mayhem. and The Initiative. lost between them 80 ships, including 52 dreadnoughts, 1 carrier, 6 force auxiliaries and 1 battleship for a total of 190.26 billion ISK. *All the images featured in this article were taken by Niden and used with his explicit permission. Excellent items from you, man. I have bear in mind your stuff previous to and you are just extremely fantastic. I really like what you’ve bought right here, certainly like what you are stating and the way by which you assert it. You make it entertaining and you continue to care for to keep it sensible. I can’t wait to read much more from you. This is really a great web site. An outstanding share! I’ve just forwarded this onto a co-worker who had been conducting a little homework on this. And he actually bought me breakfast due to the fact that I stumbled upon it for him… lol. So let me reword this…. Thank YOU for the meal!! But yeah, thanx for spending some time to discuss this matter here on your web page. After study a couple of of the weblog posts on your web site now, and I really like your way of blogging. I bookmarked it to my bookmark web site checklist and will probably be checking again soon. Pls check out my website as effectively and let me know what you think. You really make it seem so easy along with your presentation however I find this matter to be really something which I feel I’d by no means understand. It sort of feels too complex and very extensive for me. I am having a look forward to your next post, I will try to get the hold of it! I believe this website has got some real superb info for everyone :D. “Anybody who watches three games of football in a row should be declared brain dead.” by Erma Bombeck.